Another successful night's sleep - more evidence that I am in a parallel universe. Things are slow to get going this morning. Sharon and I never consciously make a decision to ride with the rest of our small breakaway group it just seems that we're all sort of ready at the same time, we're all going the same way and we're all sort of in the same kind of mood I guess. It just feels natural and right today. Pack up and load up. Dry and warm in the morning sun. With bags on our bikes and the sun in the sky we depart. We are being lead by everyone's hero, the infamous Bernard Smith then alongside Sharon and I ride Sue, Dawn and Peter. That's 6 bikes all winding through a serpentine trail along the peninsula coast and of course the superlative scenery. It takes what seems to be an age to cover just 25 miles but this is single track that rises and falls then writhes and wriggles through the angular multilevel geology. Speed is impossible with blind bends and hidden dips, such is the nature of this road. It is still great fun though. Bernard takes us off the main road for a brew break at a cafe in Sheildaig. As we return to the bikes there's just a spot of rain, I suggest it may be time to waterproof up again. Sheildaig, beautiful as expected through the skies are darkening. 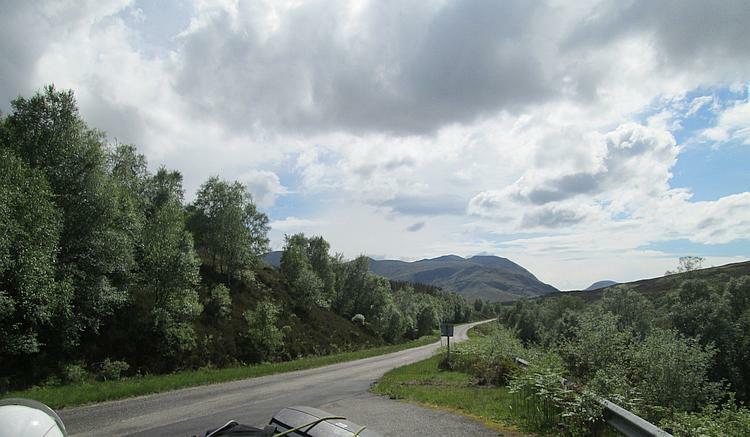 The road between Kinlochewe and Gairloch is twin track and a much faster more sweeping affair. The rain is intermittent but heavy enough to ensure the road is wet and Bernard is maintaining a just about legal 60 or so mph speed through all but the sharpest turns. I have a feeling for the road today and keeping up in spite of my usually gentle wet weather pace seems perfectly natural and secure. Given time and practice I may make an average motorcyclist one day. Gairloch is the next brew break and the rain is more intermittent now to the point where you could argue it's "mainly dry". 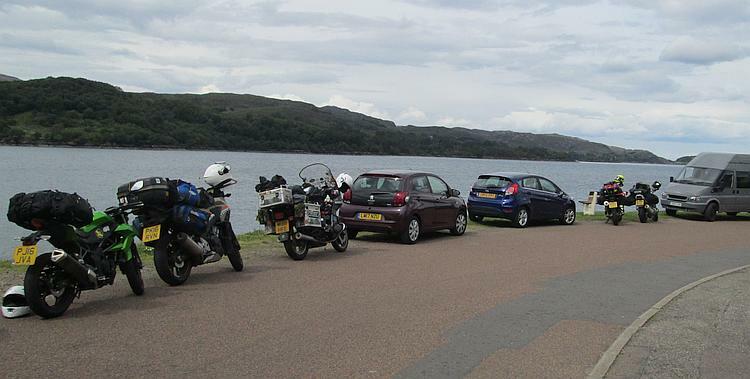 One more photo opportunity is taken just before we turn onto the A835 and into Ullapool. Considering the changeable weather I must say the ride has been wonderful, matching the scenery. I am thankful we've split this leg, it's made the journey much more relaxing and pleasurable. The rain comes and goes, the views are always melodramatic. 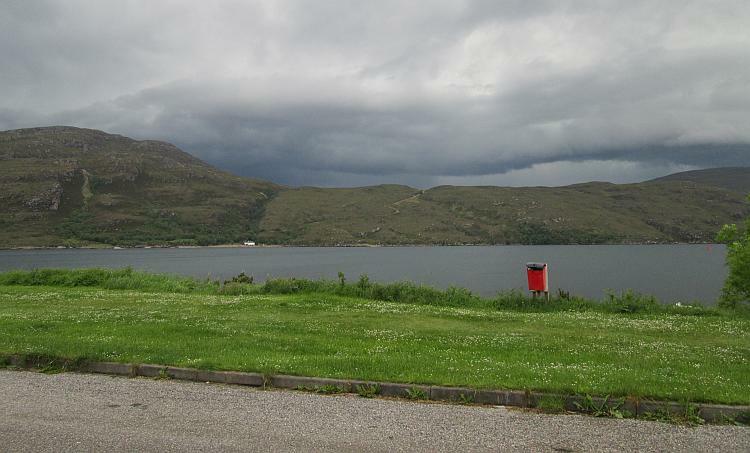 Regular readers will know I fell in love with Ullapool quite a few years ago now (The Scottish Trip 2008 - Thurso To Ullapool). I feel right at home here, I know where the petrol station is to fill up, I know where the campsite is and I know where the pubs, chippy and shops are too. Adventuring into strange and unfamiliar territories is all very exciting but sometimes the familiar can be welcome too. I get that ridiculous coming home feeling again. We get the tent up and the gear stowed away just in the nick of time. As we depart to go to the shops the rain starts, I'd say that was perfect timing. I have just declared how well I know Ullapool only to find I'm lost and I've taken the longest and most convoluted route to Tesco, I ought to be ashamed of myself, fool. At least we have supplies for the next couple of days as the rain grows heavier on the now short walk back to the tent. I am quite concerned about those making the full journey from Glencoe to here. While it won't go dark until after 2200 I do hope they're OK, as and when they do arrive they'll be making camp in the rain and they will surely be exhausted and travel weary by now. 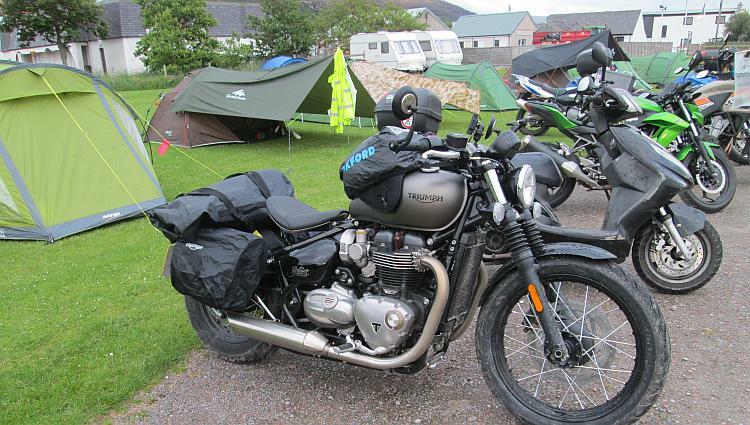 A little later I'm relieved to hear the sound of multiple motorcycles pulling onto the site and up close to our camp. They are indeed wet and weary but everyone is fine and in good spirits. They're a hardy bunch I must say. One member has a brand new Triumph Bobber, another lady is on a Yammy scoot with "L" plates. The evening brings a sit down meal in the curry house at the entrance to the campsite. While I doubt the restaurant will win any Michelin stars the food is satisfactory, the prices manageable and the company is perfectly convivial. Sharon and I engage with people we know, people we only met yesterday and people we've only just met this evening. What is patently clear is although some of us are strangers there's no holds barred with the banter being both teasing and rude tonight. I shall don my thick skin. After a drink in one of the pubs Sharon and I retire for the evening. It has been another worthwhile day and tomorrow should hopefully bring more of the same. 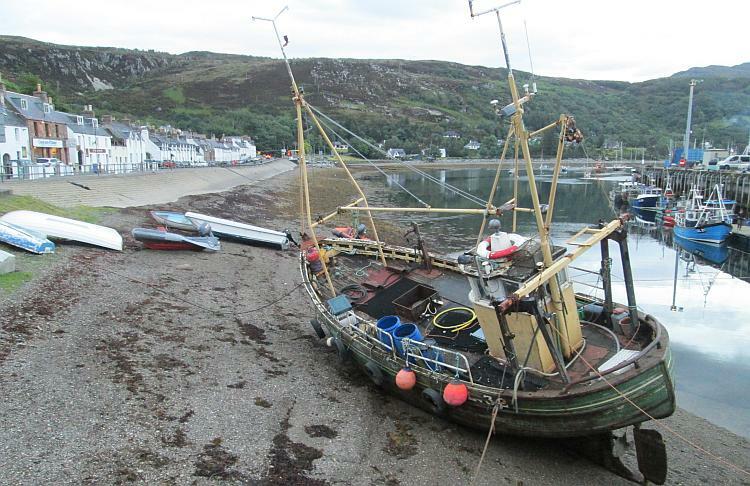 I do like Ullapool.